Aaron's Longtime Racing Partner, NASCAR Legend Michael Waltrip, Announces Final Race At Daytona 500 | Aaron's, Inc.
ATLANTA, Jan. 26, 2017 /PRNewswire/ -- Aaron's, Inc. (NYSE: AAN), a leading omnichannel provider of lease-purchase solutions, and racing legend Michael Waltrip today announced that the upcoming Daytona 500 will be Waltrip's last NASCAR race. 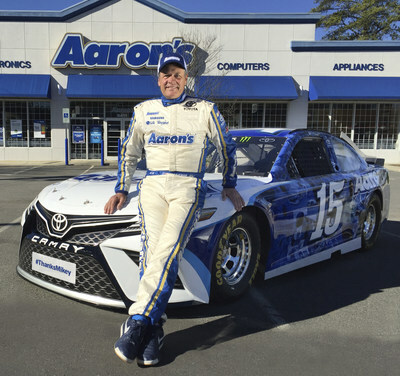 Waltrip, who will mark his 30th start at the Daytona 500 on February 26, will be at the wheel of the Aaron's #15 Thanks Mikey Toyota. Aaron's and the two-time Daytona 500 winner have been partners for more than 17 years and announced a renewed multi-year partnership last year with Waltrip as Aaron's spokesperson. "We can't wait to watch Michael compete in his last race with the same flair and thrills he's been known for throughout his amazing career, and it will be a nostalgic moment to see him and the Aaron's logo flash across the finish line together," said John Robinson, Aaron's, Inc. President and Chief Executive Officer. "Michael has been a great sportsman and partner to Aaron's." Waltrip retired from full-time racing after the 2009 NASCAR season but has continued to compete as a part-time driver. His relationship with Aaron's represents one of the longest-running corporate partnerships in the racing industry. "I can reflect on my career with a lot of emotions and one company that has been there for me is Aaron's," said Waltrip. "I started working with Aaron's almost 20 years ago with some commercials and six Xfinity Series races when I had a team behind my house. We have been together ever since and it makes my heart smile thinking about all the great things we did together." Next week Aaron's plans to debut a video showing the first of Waltrip's "Top Five Aaron's & Waltrip Racing Moments" selected from the past 17 years as partners. The videos will be shared across Aaron's social media channels leading up to Waltrip's last race on February 26. Waltrip has been featured in several Aaron's commercials and will continue to serve as a spokesperson for the company following his last race. The Aaron's Michael Waltrip tribute commercial will debut the week prior to the Daytona 500 and will commemorate Aaron's 17-year partnership with Michael Waltrip. Waltrip said, "The Daytona 500 in a lot of ways defines a racer's career and I am proud to have been able to win our sport's most prestigious race twice. I have experienced the highest of highs and the lowest of lows at the Great American Race. But when you are a NASCAR driver who has the privilege of racing here, you love Daytona no matter what happens. In my 30th and final Daytona 500, I am just going to enjoy every moment and be happy that Aaron's has given me one more opportunity to hoist the Harley J. Earle trophy." "Although Michael is competing in his last race, Aaron's is extremely fortunate to continue working with Michael and we know racing fans will enjoy seeing him at future appearances and at Aaron's stores across the country," said Robinson. Headquartered in Atlanta, Aaron's, Inc. (NYSE: AAN), a leading omnichannel provider of lease-purchase solutions, was founded in 1955, has been publicly traded since 1982, and owns the Aarons, Progressive Leasing and HELPcard brands. Aaron's engages in the sales and lease ownership and specialty retailing of furniture, consumer electronics, home appliances and accessories through its more than 1,860 Company-operated and franchised stores in 47 states and Canada as well as its e-commerce platform Aarons.com. Progressive Leasing, a virtual lease-to-own company, provides lease-purchase solutions through approximately 19,000 retail locations in 46 states. Dent-A-Med, Inc., d/b/a the HELPcard®, provides a variety of second-look credit products that are originated through a federally insured bank. For more information, visit investor.aarons.com, Aarons.com, ProgLeasing.com, and HELPcard.com.